Atty. 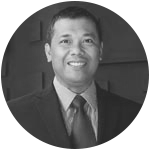 Jesus Clint O. Aranas has over two decades of experience in the field of taxation. He started his career with the Tax Division of SGV & Co. and was previously the Managing Partner of Aranas Law. Through hard work, honesty, and integrity, Clint has earned his clients’ trust and his peers’ respect. He is known in the tax community as a competent and incorruptible practitioner. Upon the assumption of the new administration, President Rodrigo Duterte appointed Atty. Aranas as Deputy Commissioner of the Bureau of Internal Revenue to lead the legal arm of the Bureau of Internal Revenue and assist the new Commissioner, Comm. Caesar R. Dulay, in implementing tax policy and administration reforms in the organization.